Custom heights must be requested at time of purchase and cannot be adjusted once received. Please email concierge@kellywearstler.com for assistance. Please contact us directly for rewiring information. This item must be returned in the factory carton packed exactly as it was shipped otherwise returns will not be accepted. There is a 35% restocking fee on all applicable lighting returns. The Tableau Medium Pendant is a modern classic with its dynamic suspended glass shade. 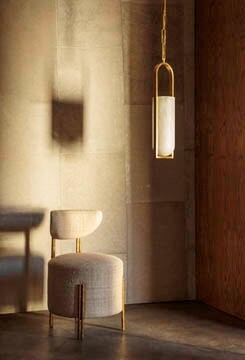 This pendant is available in Antique Burnished Brass, Bronze or Polished Nickel with either a clear or textural sandblasted glass and is rated for use in damp locations. Featuring perforated metal in a sculptural form, this collection is born out of a love of architecture, and the interplay of light over form. These perforations, a signature design element within Kelly’s practice, diffuse and reflect light, adding delicate texture and a rich sense of depth to any space. Available in Antique-Burnished Brass, Bronze, and Polished Nickel with Clouded Glass. The Cleo Large Chandelier highlights the beauty of mixed materiality in bold geometric forms. This chandelier in Antique Burnished Brass features gilded shade interiors, and the option of either Antique White shades with White Marble sphere or Black shades with Black Marble sphere. The Strada collection is delicate and ethereal, drawing inspiration from Kelly’s love of bronze and vibrant, organic forms. Each sculptural piece, with a seemingly random array of radiating quills, plays with cast shadow to evoke a soft sophistication. Available in Aged Iron, Burnished Silver Leaf, Gild, and Polished Nickel.